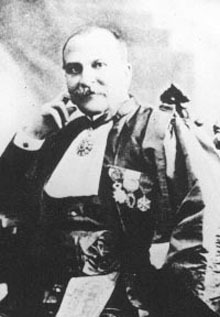 French chemist Paul Sabatier studied under Marcellin Berthelot and conducted key research into catalysis (the alteration of a chemical reaction by adding a substance which itself is not changed or consumed in the process). He won the Nobel Prize for Chemistry in 1912, for his explanation of the use of nickel as a catalyst for hydrogenation. His work in catalysis made posible the subsequent development of margarine, hydrogenated oils, and the synthetic methanol industry, and he is the namesake of the Sabatier principle, which governs chemical interactions between catalyst and substrate. Not to be confused with a different but contemporaneous Paul Sabatier (1858-1928), who authored a well-known biography of St. Francis of Assisi.